No matter where you stand in this national park, you will feel as if you stepped back in time. Over 300,000 acres of carved out beauty, showcasing canyon mazes, sandstone pillars, and gnarled trees. It is a spectacular destination for those seeking stunning views, as well as those visitors looking for adventure. The park is well-known for its mountain bike terrain, as well as popular spots to camp, hike, and horseback ride. And if that weren’t enough, Canyonlands is located in the heart of Moab and is near other spectacular parks like Arches, Mesa Verde, and more. The natural rock formations and beauty were formed thanks to 10 million years of flooding and depositing. As limestone, shale, and sandstone built up, the Colorado and Green rivers carved even more lands and carried deposits even farther away. People have been visiting Canyonlands for centuries and the first-known culture to live in the area were the Paleo-Indians, as far back as 11,500 B.C. By about A.D. 1100, there were ancestral Puebloans in the Needles District. Other people called the area home, like the Fremont peoples, but it was not to be a permanent home for them. By 1885, cattle ranching a big business in southeast Utah, and cattle were beginning to graze the area. And in September 1964, President Lyndon B. Johnson signed legislation preserving Canyonlands as a national park preserving its history for all to remember. The park is open year-round but spring and fall are ideal for those visitors who want to explore by foot. The summer is very hot but humidity is low, while winter can bring with it cold weather and snow. There are two paved entrances into Canyonlands: Highway 313, which leads to the Island in the Sky; and Highway 211, which leads to the Needles. If you fly there, the closest airports are located in Grand Junction, CO and Salt Lake City, UT. Commercial air service is also available between Denver and Moab. Keep in mind: While inside the park, visitors typically need a car to get around. The Island in the Sky is the most accessible district and easiest to visit in a short period of time. All other destinations require some boating, hiking or four-wheel driving to tour. Applies to motorcycles, bicycles, and walk-ins (per person). Includes all occupants of a vehicle. This will give you entrance to Arches, Canyonlands, Hovenweep and Natural Bridges for a full year. Fee depends upon the capacity of the vehicle. 1 to 6 passenger vehicles are charged $25 and $5 per person. 7 to 25 passenger vehicles are charged $40. 26 or more passenger vehicles are charged $100. Needles: This district was named for the colorful spires of Cedar Mesa Sandstone that make up the area. It is an amazing place to find trails, especially for those visitors seeking longer day hikes or overnight adventures. Foot trails and four-wheel-drive roads lead to features like Tower Ruin, Confluence Overlook, Elephant Hill, the Joint Trail, and Chesler Park. Maze: While it’s the least accessible district of Canyonlands, traveling to the Maze is worth the extra planning. Here, you will find unbelievable formations like The Chocolate Drops, standing high in the sky. Horseshoe Canyon: Do not miss this area as it contains some of the most significant rock art in North America. Check out the Great Gallery for well-preserved, life-sized figures with intricate designs. It’s also a great area to see spring wildflowers, sheer sandstone walls, and cottonwood groves. 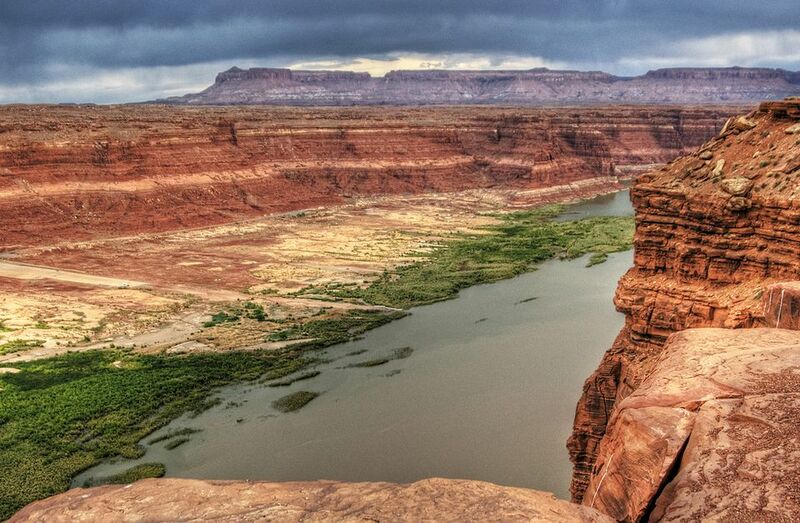 Rivers: The Colorado and Green rivers wind through the heart of Canyonlands and are ideal for canoes and kayaks. Below the Confluence, you will find a world-class stretch of white water to explore. Mountain biking: Canyonlands is famous for its mountain biking terrain. Check out White Rim Road at the Island in the Sky for some incredible rides. Also noteworthy is the Maze which offers riders multi-day trip possibilities. Ranger-led activities: Rangers present a variety of interpretive programs March through October at the Island in the Sky and Needles districts. Schedules and times vary so check visitor center and campground bulletin boards for current listings. There are two campgrounds located in the park. At the Island in the Sky, sites at Willow Flat Campground are $10 per night. In the Needles, sites at Squaw Flat Campground are $15 per night. All sites are first-come, first-served and have a 14-day limit. Backcountry camping is also popular in Canyonlands and requires a permit. There are no lodges within the park but there are plenty of hotels, motels, and in in the Moab area. Check out Big Horn Lodge or Pack Creek Ranch for affordable rooms. If you are traveling with your pet, keep in mind that the park has a lot of regulations. Pets are not allowed on hiking trails or anywhere in the backcountry. Pets are also not allowed with groups traveling by four-wheel-drive vehicle, mountain bike, or boat. Pets are allowed in the developed campgrounds and may be walked in the park along paved roads. Pets may also accompany visitors traveling the Potash/Shafer Canyon road between Moab and the Island in the Sky. But remember to keep your pet on a leash at all times. Arches National Park: Located high above the Colorado River, the park is part of southern Utah's canyon country. With over 2,000 natural arches, giant balanced rocks, pinnacles, and slickrock domes, Arches is truly spectacular and a great place to visit while in the area. Aztec Ruins National Monument: Located just outside the town of Aztec, New Mexico and showcases the ruins of a large 12th-century Pueblo Indian community. Its a great day trip for the whole family. Mesa Verde National Park: This national park protects over 4,000 known archeological sites, including 600 cliff dwellings. These sites are some of the most notable and best preserved in the United States. Natural Bridges National Monument: Looking for a day trip and great scenic drive? This is the place. The national monument is open year-round and showcases three natural bridges carved out of sandstone, including the second and third largest in the world.